Ok, so am I the only person around that was waiting with bated breath for Jen Wilson to launch her little freebie on the digi-universe and then for it never to actually happen? What gives?? I checked that site faithfully every hour (ok, to be honest, every 5 minutes) for 2 whole days. Sammy just came and interrupted my typing to read his book to me… “Alexander and the Terrible, No Good, Very Bad day.” Poor Alexander, I know exactly how he feels! 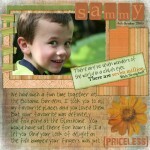 But it WAS a very cute story, and Sammy got through it very well – I forget sometimes that he’s only in Grade 1. Scrapping wise, it has been a good day. However nothing else much has been good. 🙁 Some of my friends seem to be drama queens at the moment and I just don’t have the energy for one more phone call listing all their woes… I never get asked how that trip to the Dr’s went, or whether I’ve got water in my kitchen again – after 2 weeks without! It’s hot, I’m sticky, and in case you didn’t notice, grumpy too. So before I turn this into a total rant, I’ll stick a cute baby in here so you can all go ooooooh and Aaaaahhh…..
Papers are from a new set by Ashley Olson called Sweet Little Boy, heart and photo prongs from Ash and Dawn’s Express Yourself CD. Fonts used are DSP Old General Store, what a COOL font! and 2 Peas Well Behaved. Stitching is my own! There is something just irresistible about that fuzzy dome. Something very kissable. that are soft and fuzzy and totally adorable. Tyson, August/September 1997 approx 5 months. Oh Cassie I am so sorry to dump my stuff on you too…..I feel really bad now!!!! No more venting from me I promise! Hope you are feeling better and do get a good nights sleep.